If you follow me on twitter...(if you aren't following me..follow me..thanks) I am always ranting and going off about something. Its my online therapy...hehe! I often speak about the misconceptions of blogging and being an influencer. I have been blogging for nearly 10years, back when this was just a place to post and go. It was an online diary for me to share my experiences in the fashion industry, shopping experiences and my highly un-requested opinions. Fast forward to current day, blogging isn't anything like it used to be. It has become a popularity contest, full of people who love the art of blogging, who take flawless photos, who are just a pretty face, those who are online celebrities and those who are just kinda there floating through the internet! Simple answer.. this ish isn't easy people!! I don't know what you think some of us bloggers, content creators, influencers do all day. I can only speak for myself, but this isn't a simple job! Especially if you are doing it by yourself..aka ME. I don't have the luxury of an editor, producer, assistant or team. If you follow me on snapchat (yep..go on and follow me if you aren't..its the closest you will get to daily vlogging..until I decide to buy a vlogging camera) I was speaking on hiring an assistant, to help me out from time to time. There are days when I need extra help, whether it be equipment set up, editing, event planning... but then I am so particular about how things are done, so I am very anxious to hire someone. Now do not get me wrong, there are perks to my job, I have accumulated more makeup than I could ever use, I could easily open a natural hair store with the amount of hair products I own, I own designer sunglasses and handbags, nice clothes and have even been on holiday for free!! Yes I am grateful, I am blessed and very thankful... but really and truly.. I frigging earned all of that if not more! Being self-employed has been one of the hardest journeys I have been on, as I have to provide for myself. If I don't work...bills don't get paid. If I don't work... food doesn't get bought. If I don't work..things don't happen. I don't have the luxury of just being a pretty face. I have to put the work in to get the reward. - Check social media...all 38350830 platforms. Reply to comments, answer any questions, post something, catch up with the latest news and gossip. - Check emails. Reply to emails. This could involve providing information, images, content. * set up equipment, which means set up light boxes, camera, monitor. * check I am in focus...listen I have filmed many many videos out of focus and had to re-film them! * record..do hair routine. get out of shower. dry my skin. cream my skin. put on clothes. - Edit video, which can take anything from up to 8hours depending how detailed it is. - Add music to video, making sure it sets the tone of the video..shout out to @BeatsByTrade for my tracks! oh and this is a light day.. I have left out ALOT of things. but you get the gist of it! Oh and somewhere in there.... EAT!... real talk. The time right now is 5:04pm and all I have eaten is a cheese bagel and a packet of Light Bites Roasted shallot and cider vinegar popped chips and half of a Light Bites Quinoa, honey & pumpkin seed bar. Thankfully their snacks keep me going until I eat properly. 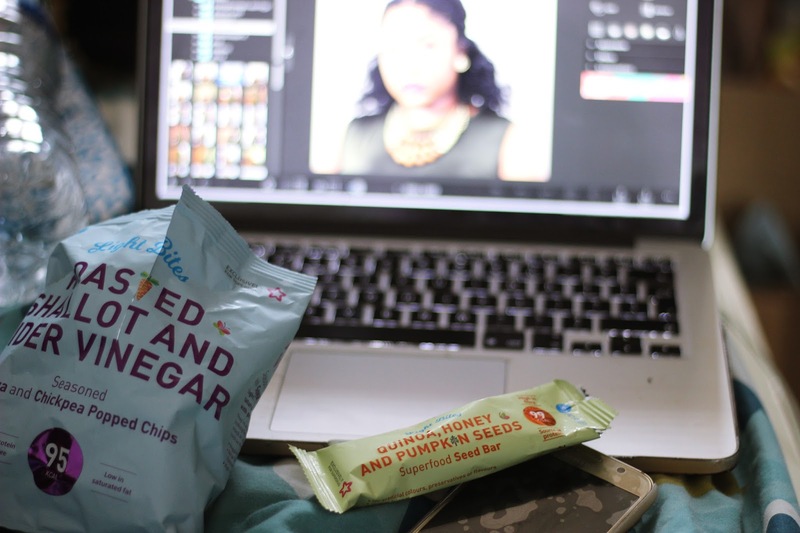 I do have a problem when it comes to snacking and I often snack on crap whilst editing because I don't have time to cook anything until dinner. Light Bites sent me a whole box of snacks for me to try out and they are filling, healthy and actually taste good!! They are exclusively in Superdrug so next time when I go to get my cleansers and makeup top ups I will be picking up a whole load to keep me going. 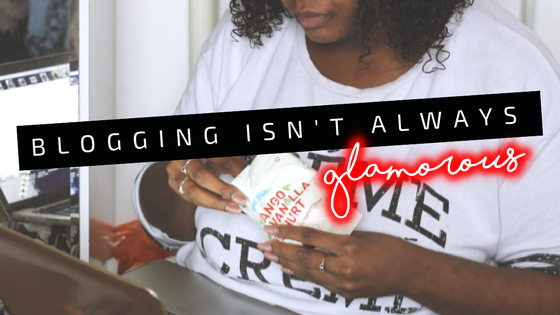 So...I say all of this to say.. if you want to become a blogger, influencer, content creator, be prepared to put in work if you want to see all the glam, glitz and champs of this industry. Even though this sounds like one big mega rant... I am in very grateful to be in a position doing something I enjoy. The late nights and long hours are worth it when you meet a supporter who loves your work, or you receive an email from a brand who want you to speak at an event because of your online presence. The material perks are just those..material things, to know you can empower people via your platform and voice is why I do this and why I enjoy doing this..no matter how tiring it can be at times. And stay tuned for information on my blogging seminar coming soon, where I will be sharing all of my secrets, tips and tricks for being successful in this industry. I will also be speaking at Hustle&Heels Ladies Lunch, Women who win event April 2nd, if you can come along and learn some amazing advice about being a female go-getter in this cold world! !